Hydrogen can be produced using a wide variety of resources found here in the U.S. Hydrogen can be renewable and produced from waste, biomass, wind, solar, tidal, wave, and geothermal. Production technology includes electrolysis of water, steam reforming of natural gas, coal gasification, thermochemical production, and biological gasification. Producing hydrogen creates almost zero criteria pollutants and when used in a FCEV, reduces GHG emissions by at least half when compared to a conventional gasoline vehicle. When using renewables, GHGs (greenhouse gases) can be reduced by more than 90%. Passenger vehicles at transportation hubs for fleets are good candidates for hydrogen fueling and the use of FCEVs because they mostly operate on fixed routes or within fixed districts and are fueled from a centralized station. 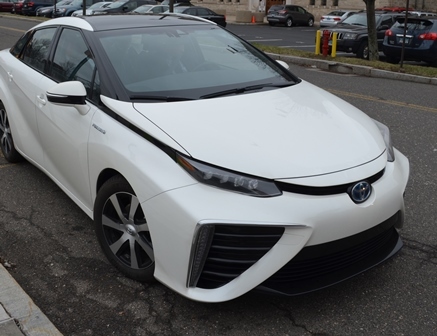 These zero emission FCEVs could replace existing conventional fleet vehicles in Connecticut. FCEVs running on hydrogen, produced from renewable resources, virtually eliminate all GHG emissions compared to conventional fossil fuel powered vehicles. Passenger car emissions of CO2 are reduced by 4.67 metric tons CO2E /vehicle/year. Automakers are now making plans to comply with a ZEV program, which is modeled after the California ZEV Action Plan. Eight (8) states have committed and signed a Memorandum of Understanding (MOU) requiring large-volume automakers to sell approximately 3.3 million ZEVs between 2018 and 2025; 1.24 million of which are defined as “Electric and/or Hydrogen Fuel Cells” with the remainder being plug-in hybrid electric vehicles (PHEV).